Thank you for helping us identify a Monthly Spotlight Item about which we need information! FEBRUARY 6, 2003: WHO WAS BOSTON'S HUGH MCBREEN? 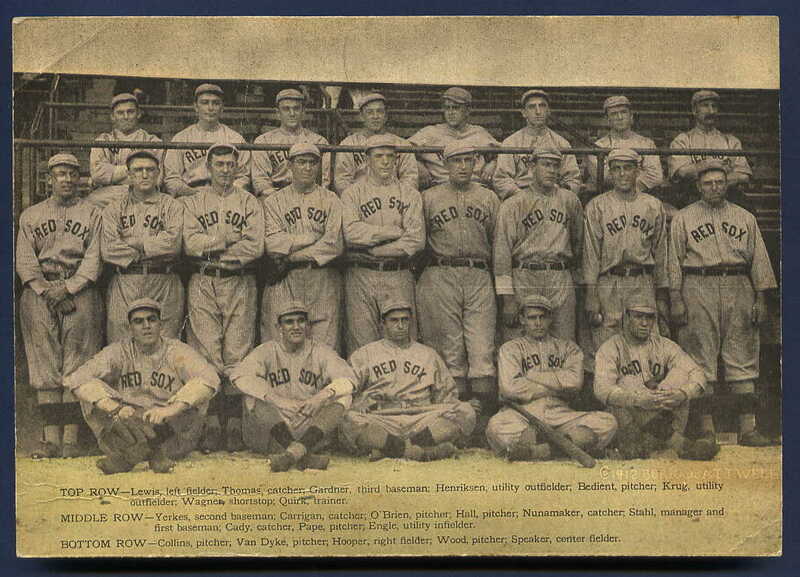 Here's what we do know: This postcard is a highly scarce metamorphic card of the 1908 Boston Red Sox, published by J.P. Furlong. Click on the card to enlarge. This low-grade specimen is missing the fold-out section that featured the entire team, but does include Manager John McGuire, the pre-Fenway Huntington Grounds Ballpark, Owner John Taylor and Hugh McBreen. 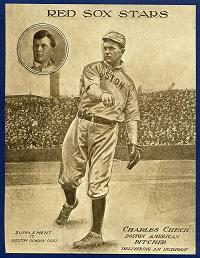 A challenge for Boston fans and collectors: Who was Hugh McBreen? If you have any information, you can provide it via the form at the bottom of this page. Click here -- -- to jump to the form below. This page will spotlight collectibles in need of identification, selected from the broad array of unidentified postcards, baseball cards, photographs and memorabilia spread throughout this site. We're hoping VintageBall users can help solve these mysteries. In addition to this special showcase page, VintageBall features many such items in need of information, sprinkled throughout the different sections of the site. These items are marked with a special icon -- -- that users can click to instantly provide any information they may possess about the ephemera in question. 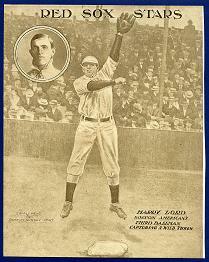 This blank-backed card, which features NY Giants Third Baseman Buck Herzog, is clearly a caramel isue. Click on the card to enlarge the image. As can be seen in the illustration below, this card is roughly the same size as other caramel issues, with the exception being the top of Buck's head, which pokes out above the frame. In fact, it is almost certain this oddity is also the key identifier in designating this as a caramel card, with the head serving as the "tab" of a small candy box. 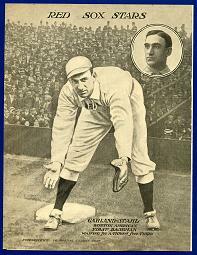 The controversial Herzog played from 1908-20 with the Giants and Reds, appearing in four World Series. If you have any information, you can provide it via the simple form at the bottom of this page. Click here -- -- to jump to the form below. 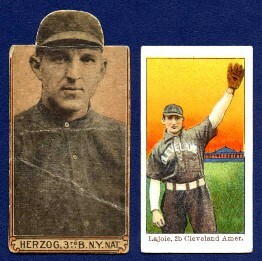 Here is the same card, aligned with an E92 Dockman of Napoleon Lajoie, to clearly illustrate the relative size of the unidentified Herzog issue. This is a 1910 J=K Candy box card, manufactured by J. Koenisberg, NY. Interestingly, the box also advertised Candy & Jewelry. In 1908 Hugh McBreen served as Secretary and Treasurer for the Boston ballclub, a position he held from 1906 to 1909. Prior to that he had been Boston's Assistant Business Manager in 1903. 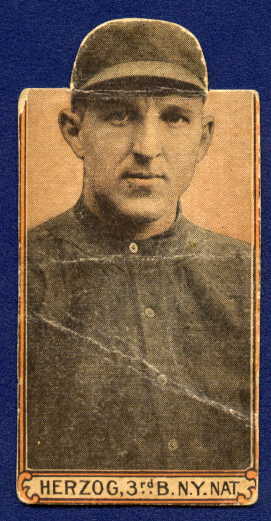 No record exists of his connection to the team from 1903 to 1906. 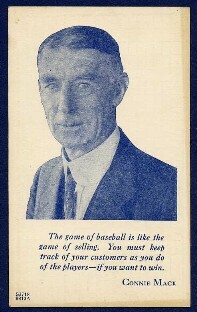 This doubled-sided Connie Mack premium or insert features a portrait of the venerable manager on the front above a quote, with the reverse spotlighting his instructional on how to score a ballgame. Click on the cards to enlarge the images. This item is postcard-sized and is printed on card stock. 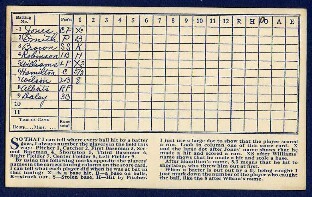 Interestingly, the "line-up" printed on the scorecard back features the following names: Jones, Smith, Robinson, Brown, Williams, Hamilton, Wilson, Alberts and Daley -- likely a generic sample team. Additionally, the front includes two numbers in the lower left: S3718 and 8813A. Age of the item is difficult to ascertain, as Mack is wearing an old fashioned "rounded" collar on his short. Likely a 1930s or 1940s item. The key to identifying this card likely is the quote from Mack on the front: "The game of baseball is like the game of selling. You must keep track of your customers as you do of the players---if you want to win." As such, this item might have been intended to be distributed to salesmen, either as part of a training course or as a giveaway at a company event or inserted in other literature. Was this a premium, an insert? When exactly was it issued and for what purpose? If you have any information, you can provide it via the simple form at the bottom of this page. Click here -- -- to jump to the form below. The existence of this card is most curious, raising many questions. 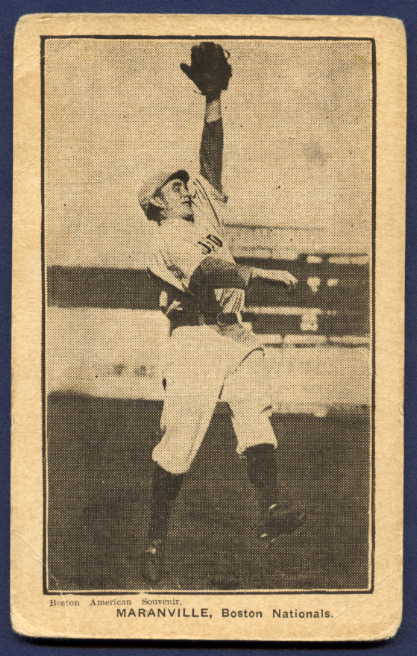 The card was issued by The Boston American newspaper and features an in-action photo of Hall of Famer, Rabbit Maranville, star shortstop of the Boston Braves from 1912 to 1920. Interestingly, the 2003 SCD Standard Catalog of Baseball Cards includes a similar series issued in 1912 by the same newspaper, depicting players from the World Champion Boston Red Sox. Unlike the Red Sox cards, the Maranville postcard pictured at left is of a cruder variety, with a rougher overall appearance. While the Sox cards have high quality photos that appear to float on creamy stock, these cards of the Boston Nationals (and others?) are coarser, with thicker black border lines and fuzzier potos. Interestingly, this Maranville card is also markedly different than the cataloged series, in that it is labeled "Boston American Souvenir" and showcases a photo with a ballpark background. For their part, the 1912 Red Sox cards airbrush out the ballpark backdrops and do not include the word "Souvenir." 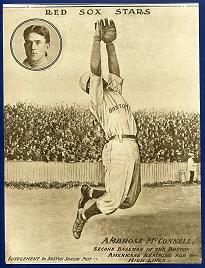 Also, the Maranville card only includes the player's last name, also a departure from the style of the Red Sox series. Click on the card to enlarge the image. 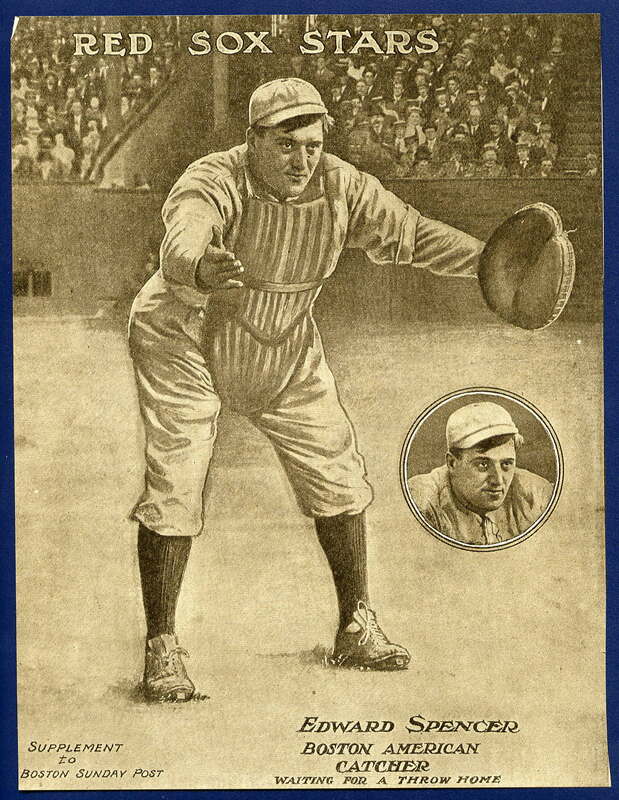 Possibly issued in 1914, the year the "Miracle Braves" won the World Series, this card cries out for additional information from knowledgeable sources. If you have any information about date of issuance, other players in the series, etc., you can provide it via the simple form at the bottom of this page. Click here -- -- to jump to the form below. 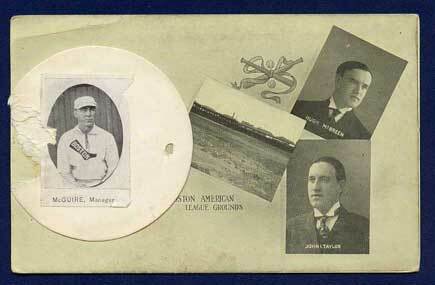 Slightly larger than a standard postcard of the era, this blank-backed item most likely was a premium. 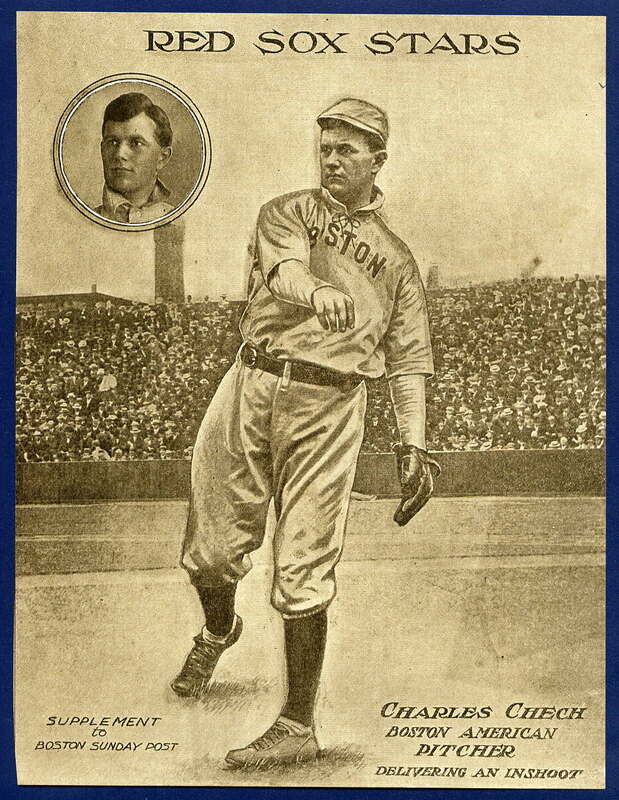 Featuring the 1912 Boston Red Sox -- who took home the World Series championship that year -- this card is colorized or tinted to give the appearance of grass and flesh tones. This item was published by Burk & Attwell and sports a copyright date of 1912 on the obverse. This same card has been seen before with a printed or overstamped advertisement for a local oyster house on the reverse. Most likely a premium, this card may also be a postcard proof or an oversized postcard that never received its back printing. 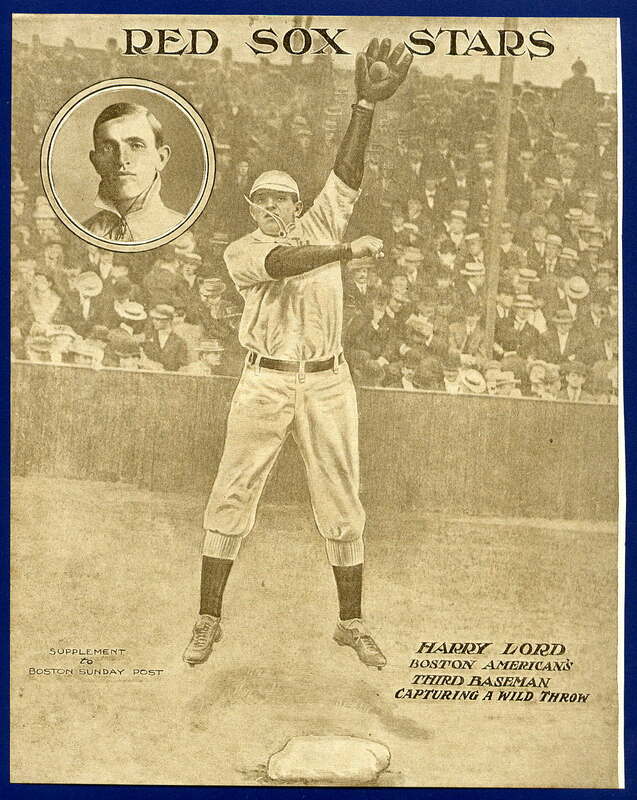 All the key players are easily visible, including Tris Speaker, Joe Wood, Duffy Lewis, Harry Hooper, Jake Stahl and others. All player names are printed below the image on the front, clearly delineating the team members posed along the front railing of the ballpark. The 2003 SCD Standard Catalog of Baseball Cards does not include this intriguing item in the guide and only one other has been seen at auction during the past years. Click on the card to enlarge the image. If you have any information about this card -- including its purpose or method of distribution and/or any info on its issuers -- you can provide it via the simple form at the bottom of this page. Click here -- -- to jump to the form below. 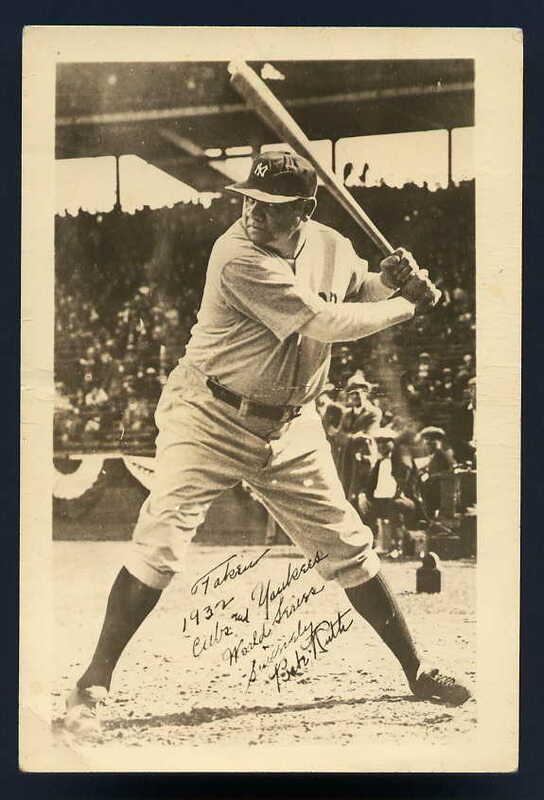 This postcard-sized card captures Babe Ruth at the plate at Wrigley Field, with this printed notation in Babe's own hand: "Taken 1932 Cubs and Yankees World Series Sincerely Babe Ruth." It was during the Yankees' sweep of this series that Ruth hit his famous "called shot" home run against the Cubs' Root. The card was produced as a "Real-Photo" card, as it is an actual photograph issued on card stock. However, this specimen is blank-backed and does not feature a traditional postcard back or photo paper manufacturer stamp box, as do real-photo postcards. (For more information on real-photo postcards, visit the real-photo postcard page). 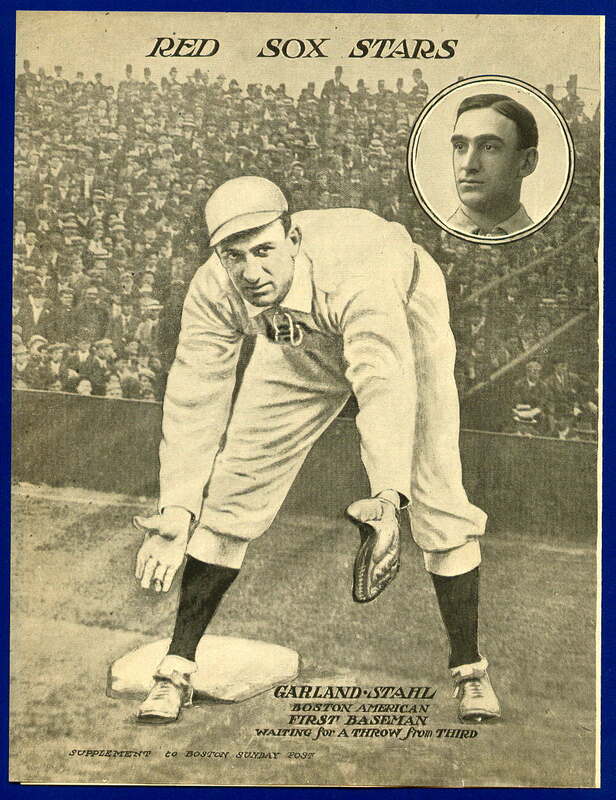 However, this card is featured on the front cover of Ron Menchine's Baseball Postcard Collection: A Chronological Postcard Survey of Baseball's Greatest Names and Faces," published by Tuff Stuff. As such, it is likely that it was issued with and without a postcard reverse. Menchine writes that this is a premium postcard -- implying that it was a give-away during or immediately following the World Series. 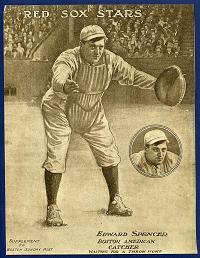 Some have speculated that it was a newspaper premium, similar to contemporaneous larger size Ruth premiums catalogued in the 2003 SCD Standard Catalog of Baseball Cards. If you have any information about the issuer, exact date of issuance and / or method of distrbution -- or any other pertinent information -- you can provide it via the simple form at the bottom of this page. Click here -- -- to jump to the form below. 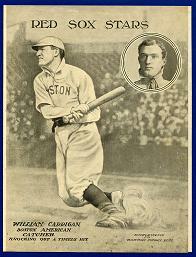 These uncataloged 1909 supplements feature portrait and in-action photographs of the Boston Red Sox. Click on each supplement to enlarge. Featuring the same Charles (Carl) Horner portrait photographs as those on the T204 Ramly and T.T.T. tobacco card series of the same year, these scarce supplements were issued by the Boston Sunday Post. In fact, all the supplement players uncovered to-date have a companion T204 series card. Slightly smaller than 8x10, these supplements can be found individually and connected two-to-a-sheet. It is not surprising that Horner photos were used, as his studio was locted on Winter Street in Boston. 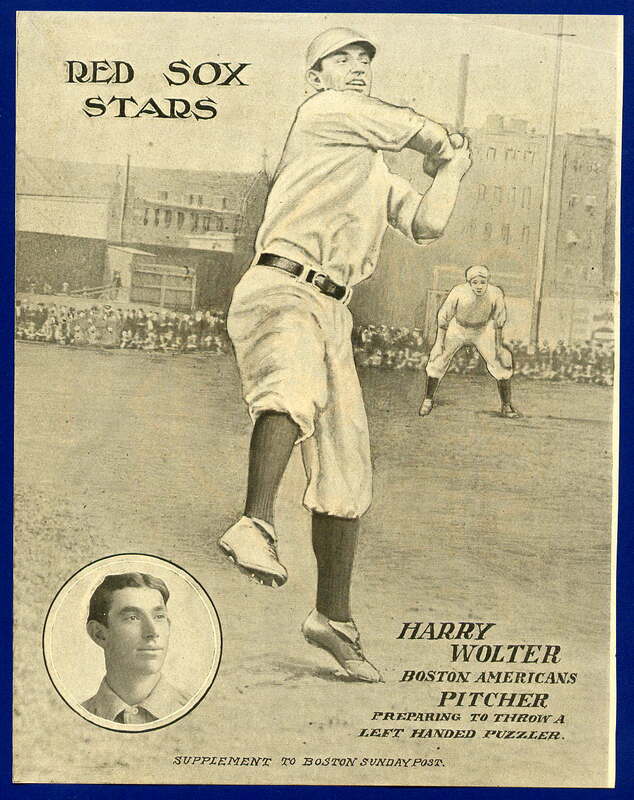 Moreover, Horner was the offficial major league photographer whose photographs were featured in such renowned baseball card issues as the T206 and T205 tobacco sets, E107 Breisch-Williams, Fan Craze and others, and his work was often showcased in sporting publications of the day. 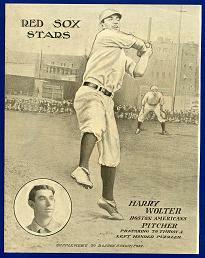 Players known to exist in this series inlude Tris Speaker, Bill Carrigan, Jake Stahl, Tubby Spencer, Harry Wolter, Harry Lord, Charles Chech, Ambrose McConnell and a handful of other Sox standouts. Interstingly, a close review shows that the type face can vary from supplement to supplement, as can the coloring (from gray to sepia). Five of the seven supplements shown on this page were discovered in a town south of Boston. If you know of any other information about this series' checklist, how these supplements were distributed, specific dates of issuance -- or any other pertinent data -- you can provide it via the simple form at the bottom of this page.